Get full details about this Finance for the Supply Management Professional training sent to your email immediately after you enter your contact details on the right. Purchasing professionals who want to learn about the relationship between finance and procurement and master and/or revisit the advanced concepts of the financial side of the purchasing/procurement process. 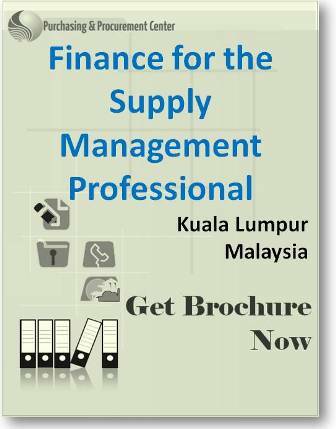 For full details & brochure for this Finance for the Supply Management Professional Training , as well as when & where it may be conducted, simply fill in your details on the right. You will also receive a Free Subscription to Purchasing & Procurement's Center "Weekly Purchasing Tips", that show you how to run and manage better your purchasing & procurement functions.